The main difference between Google Docs and Google Drive is that the Google Docs is a web-based document management application to create and edit word processing documents while the Google Drive is a file storage and synchronization service. Google is an American multinational technology company that provides Internet-based services and products for cloud computing, online advertising technologies, and other software and hardware. Google Docs and Google Drive are two such Google services. Google Docs allows creating and editing word processing documents. It helps both individual and real-time collaborative projects and is popular due to its simplicity, ease of collaboration and constant product updates. On the other hand, Google Drive is a file storage and synchronization service. Google Docs is a free web-based application that allows storing, creating, and editing documents online. It is possible to access these files from a device with an internet connection and a web browser. The document owner can allow other Google members to view the document. There are multiple advantages of Google Docs. It provides smart editing and styling tools to easily format text and paragraphs. It has free fonts, links, images, and drawings, etc. as well as templates. It also has already build resumes, reports, and other different documents. Therefore, the users can easily use these tools for their work. In an academic or business related project, sometimes it is required for everyone to work on the same document. 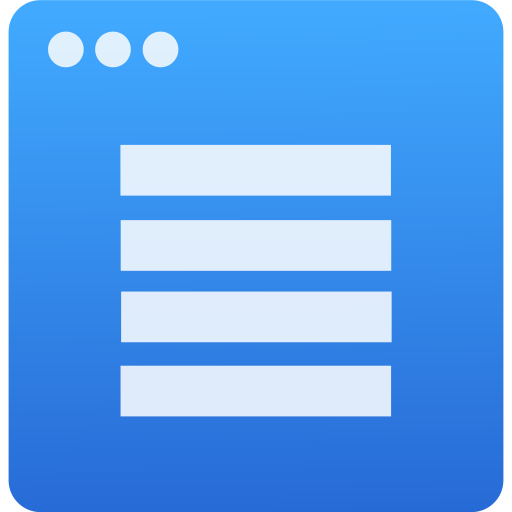 Google Docs allows a group to work on the same documents at the same time. The changes are saved automatically. It is also possible to check the history and view an older version of the same document. Moreover, he can access, create and edit the Google Doc documents using any device such as a smartphone, tablet or a personal computer. 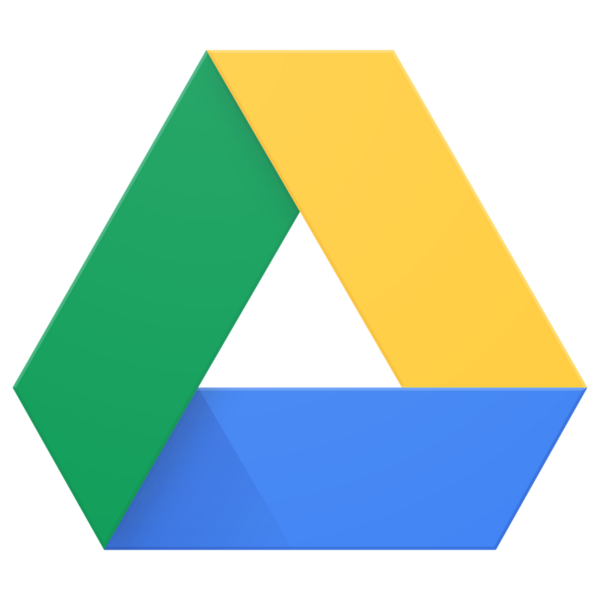 Google Drive is a file storage and a synchronization service developed by Google. Usually, it is not possible to exchange large files such as videos using the Gmail. Google Drive is an excellent alternative to this issue. It allows the users to store files on their servers, synchronize and share files. It allows storing images, videos, recordings, stories, designs, drawings and many more. It includes Google Docs, Google Sheets and Google Slides to create documents, spreadsheets, presentations and many more. Google Drive provides 15 gigabytes of free storage to Google account holders. Additionally, the users can obtain 100 gigabytes, 1 terabyte, 2, 10 and 30 terabytes by payment, if he requires more capacity. The user can share the files and folders with other users by changing the privacy settings. He can invite other users to view, download and collaborate on all necessary files. There is no need for email attachments. Another advantage is that the user can access his files from any device such as smartphones, tablets or personal computers. Therefore, he can easily reach the required files with a minimum amount of time. Google Docs is a part of a comprehensive package of online applications offered by Google. In contrast, Google Drive is a file storage and synchronization service developed by Google. While Google Docs allows the users to store create and edit documents online, Google Drive allows the users to store files on their servers, synchronize files and share files. Google Docs and Google Drive are two services offered by Google. 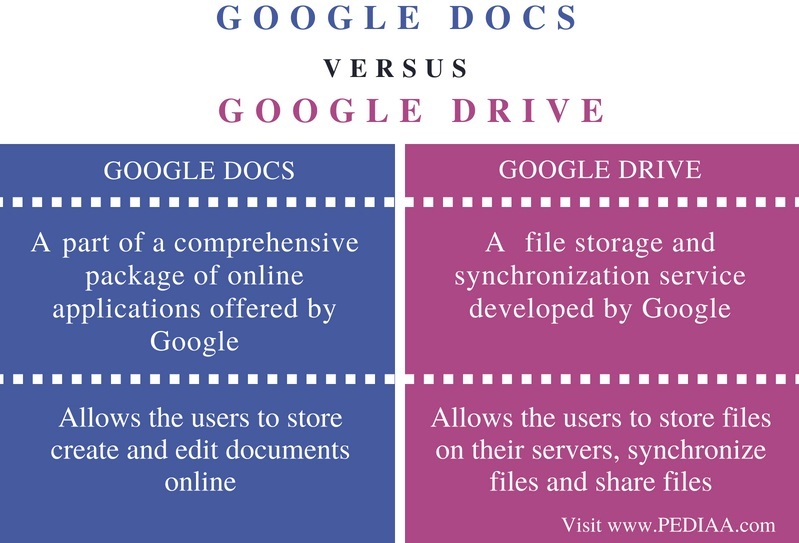 The difference between Google Docs and Google Drive is that the Google Docs is a web-based document management application to create and edit word processing documents while the Google Drive is a file storage and synchronization service. 1. “Google Docs, Sheets, and Slides.” Wikipedia, Wikimedia Foundation, 17 Aug. 2018, Available here. 2. “Google Drive.” Wikipedia, Wikimedia Foundation, 17 Aug. 2018, Available here.